Can the Arc de Triomphe fit inside the Opéra Garnier? The Arc de Triomphe is 50 meters (164 ft) in height, 45 m (148 ft) wide and 22 m (72 ft) deep. The next time that you're gazing up at the full height of the Arc de Triomphe, take a moment to ask yourself if it would fit inside the rectangular area where the stage is located in the Opéra Garnier. The answer is -- yes, it will! That's just one of the many fascinating facts that I learned during my recent tour of the famous opera house built on the orders of Napoleon III. 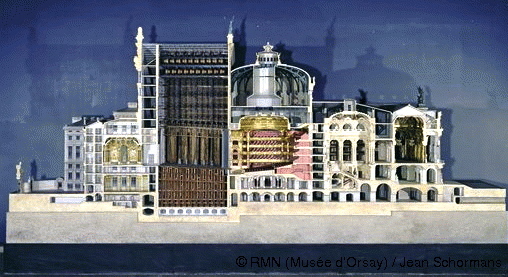 This cross section of the Opéra Garnier shows the height of the area above the stage, where the scenery may be raised and lowered. The stage, consisting of a flytower and an under-stage area, is 60 meters (197 ft) high, 48.5 m (159 ft) wide and 27 m (88.6 ft) deep, making it larger than the Arc de Triomphe. 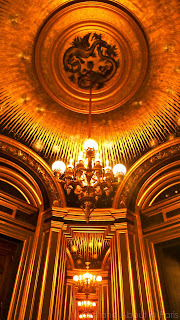 Even though I've already written a post, Over-the-top Opulence: The Palais Garnier, I thought that I would share some of the photos taken during my recent tour with Stephane and Philippe. It's still opulent and shouldn't be missed! Garnier brought mosaicists from Venice to create the glass mosaics on the ceilings and the tile ones on the floors because it was not an art that was practiced in Paris when construction started on the Opéra Garnier in 1861. The ceiling in the Sun Rotunda. The Grand Foyer. Photo credit: Philippe. Too much gold? Then take a break at the recently opened L'Opéra Restaurant. 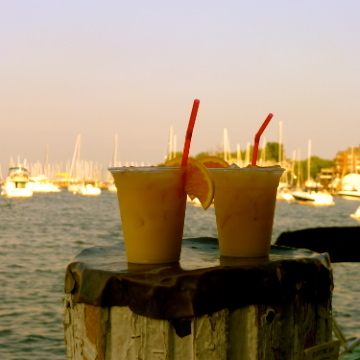 If you've already eaten there, I would love to know what you thought because it's on my list of places to try. Interesting post as usual Mary. Keep it up. Merci, Jon! And many thanks for adding the Jules Verne post to your "Scoop" page. As you already know, I always appreciate all of the useful information on your website. Never too much gold! But I love the look of the restaurant. The ceiling of the Sun Rotunda is just amazing and gorgeous--I think Hermes did a scarf of it once. Joseph, The design of the restaurant attracted much attention when it first opened. And most surprising, the kitchen seems to serve food all afternoon - not only during lunch hours. I didn't think about it until after I read your comment, but the rays and sparkles on the Hermes scarf that Stephane gave me for our anniversary in Dec. resembles the Sun Rotunda a bit. Take a look. He selected that one because the colors reminded him of the Statue of Liberty scarf that you told me about. Gorgeous! And it's interesting how the tables are sort of lined up facing the edge of "paths" through the restaurant. I've had some miserable lunches alone in Paris where waiters have stuck me on those tables two inches from everyone walking past on the footpath. People-watching is fun and all, but I don't get how Parisians apparently love dining virtually in the middle of passers-by! Gwan, Have you been to the Cafe Flore? I haven't eaten there but was surprised that the sidewalk cuts through their outdoor dining area. It's a really tight squeeze. I also like to keep a bit of space between me and the people I'm watching! What opulence! I really have to visit the Opéra Garnier the next time I'm in town! I've been meaning to do it for the longest time. On my last visit, I finally made time for Versailles! MK, that's a great scarf, and I see the resemblance. I love the glitteriness. I have another one in mind, I'll see if I can find it. Can I just say that I think you are such a cool Mom! You're so adventurous and you know all of these great fun facts of the city! I've learned more about the history of Paris from you than from living there for almost three years! Nope, I don't think so Mary Kay. I never remember the names of places I go on my travels (unfortunately) but I'm sure everywhere I've ever eaten in Paris has been very forgettable anyway! I need to take some notes from you for next time, as usually I just end up starving and going to the nearest terrible, overpriced restaurant I find! 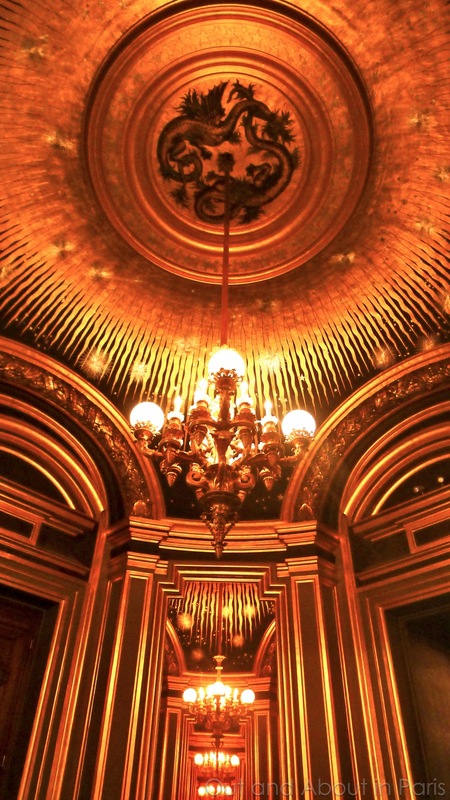 Duchesse, The Opéra Garnier is well worth a visit, especially if you do a tour with an enthusiastic guide. When I read that you were going to Versailles over Christmas, I remember thinking that it would be a good time to go. It's on my list for January or February. Thanks, Mlle Ella! I've always liked discovering stuff about wherever we live and Paris is proving to be an endless source of interest. Since my knowledge of French history, etc was basically nil when we got here, I've still got a lot to learn. Gwan, Having eaten at a couple of forgettable and overpriced restaurants here myself, I completely understand what you mean. After lots of hit-or-miss research, I'm slowly starting to know some places that are reliably good and other places to avoid.